It was estimated that between 750,000 and 1,000,000 people were at the Space Coast to catch a fading glimpse of American history. They crowded parks and straddled roadsides jamming into any available space that offered a line of sight to the last launch of the Space Shuttle Program. 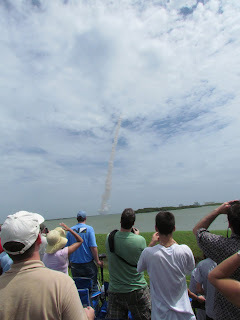 Several thousand of those onlookers were lucky enough to win the Kennedy Space Center Ticket lottery, others purchased VIP packages from tour vendors, a very lucky few were selected by NASA to attend as guest tweeters and report live via Twitter from the launch. I purchased my ticket on the open market having failed to secure one by another means. The final launch of the Shuttle as it turns out was a hot commodity and that was not unexpected. Many Shuttle ticket lottery winners saw this as an opportunity to make a fast buck. Simply buy a ticket (up to six) for $75 each and sell for $1500 each to those that wanted to be there to experience the last launch. As soon as email notices went out tickets appeared for sale online through ticket brokers. It was too fast for this to be anything other than an orchestrated way that the system had been beat. Those that wanted to go had been outdone by professionals who leveraged technology to gain an advantage, but such is the American way. The lure of making money often drives creativity and innovation. I was watching as ticket prices of early online auctions soared into the thousands. Caught in the frenzy, I bid, only to be outbid. I bid more than I planned and thought reasonable and still was outbid. The last flight of the Shuttle would not escape enterprising individuals who could make a profit and those loyal space followers who would pay any price to be there.